At the end of Part 36, Ballister warned Allin not to use the nearby elevator, as it leads directly into clinker territory. I felt that Ballister’s warning, while polite, was also coming from someone who had chosen to hole up in a tiny room rather than risk making something more of life. If I stayed away from that elevator, that would be the first step on a path to my own tiny room in the bowels of the city. No thanks. We had split up into watches because there’s trust and then there’s trust, and Tumble and I weren’t about to let our guard down with the same people who had tried to kill us only hours before. The thumping and clanking of machinery had kept me from falling asleep while on watch, but had also made it pretty miserable when it was my turn to rest. “Yes, quite a way to live,” Tumble had opined, looking around the room. The food we had shared the night before was once again making the rounds of hungry mouths, and the mood in the room was more jubilant. Ballister made a little speech when we told him that we were leaving and would not be taking his advice. The crowd mumbled their approval of Ballister’s sentiment and then he lead us out of their room and down the hallway a bit. I caught Ballister’s eye and gave him a silent thanks for keeping quiet about Tumble’s felinity, and then thanked him out loud for the repeated warning. Ballister gave me a stern look, shook his head, and walked away with a wave of his hand but without another word. “He’s an odd guy,” I remarked to Tumble. “Coming from you, that’s quite an indictment,” he replied. The corridors on the way to the elevator were in greater disrepair than those from yesterday, which I hadn’t thought possible. They had no working lights at all and the floor was strewn with broken machinery, boxes, and piles of rubble higher than my head. It took a while to carefully navigate the terrain by wristlight, and I envied Tumble’s surefootedness as he easily tackled each new obstacle. “What is all this junk?” I grumbled. “This city would be a whole lot easier to travel through if people cleaned up after themselves,” I complained as I hoisted myself slowly up the same stack, flecks of rust staining my hands and clothing. I chuckled as he gave me a final hand up, and then he bounded and I climbed down the other side of the obstruction. After a while of making slow progress this way, the going became easier, the piled-up trash diminishing in volume until the last fifty feet or so to the elevator door had no debris whatsoever. Tumble even went so far as to run a finger along the floor and show it to me. No dirt, no dust. Joking aside, I approached the cargo-sized elevator doors with much trepidation. I held my wristlight up to the call panel and saw that the down button had been gouged out. “Good thing we’re heading up, then,” I said. The Up button glowed when I pressed it, and there was a tiny whine of energy that I could feel more than hear. Tumble unholstered his gun and took up position on one side of the doors, so I stood on the other. Glancing around, I couldn’t help but think that the lack of cover meant no place to hide if something nasty popped out of the elevator upon arrival. But the only thing out of the ordinary when the doors opened was the working set of overhead lights inside the compartment. We both stepped inside and, before we had turned around, the doors slid shut behind us and the elevator began its ascent. I spun around and saw that the controls were missing; where the buttons should be was a bare panel with some small, circular holes in it. “Ballister didn’t mention this,” I said, my voice cracking. It felt like a long ride, and even though I was apprehensive about the possibility of a trap, I felt elated at how high up we were going. Finally, the elevator slowed to a stop, working more smoothly than anything in the decaying city had a right to. Tumble and I took up position on either side of the front of the elevator, and when the doors pulled apart and bright yellow light poured in, we each carefully peered around the edges. I blinked my eyes, not only at the light but at the scene that unfolded before me. Beyond the elevator’s confines was a tableau I had only ever heard about in stories. Pastel-hued houses lined either side of a broad, paved avenue, each one with a white, wooden fence surrounding a brilliantly green lawn. Cars sat in driveways and along curbs and the sound of birds chirping came from inside the lush trees that towered in a row along the concrete sidewalks. The yellow glow came from banks of lights a few stories above street level. “What in the world?” Tumble whispered. He pointed with the barrel of his gun but I already saw them, the statues. Statues with clothing on? That doesn’t make sense. Maybe they’re mannequins. They were too far away for me to make out any details, but I could see that they were all posed performing mundane tasks. Some were in the middle of crossing the street, others working on their lawns, sitting on a porch swing, getting into a car. It had probably been hundreds of years since a scene like this played out as part of everyday life, and seeing it as a still life gave me the chills. I rubbed the raised flesh on my arms and thought, Dammit, maybe Ballister was right after all. 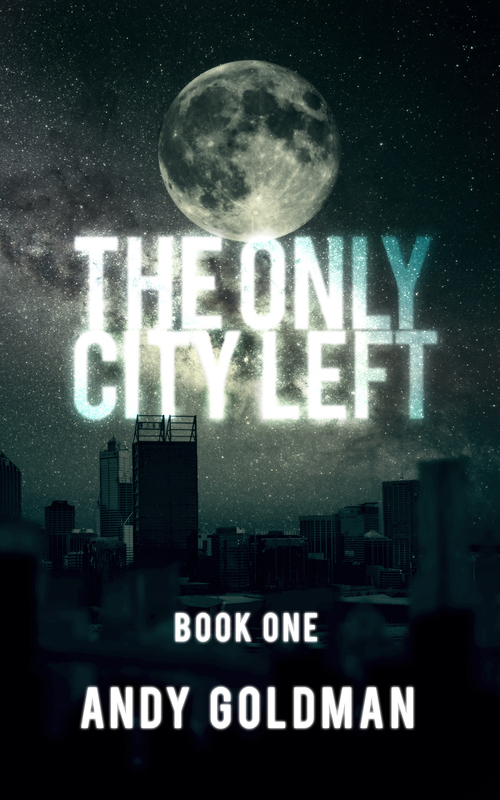 10/28/12 News: The Only City Left is now listed on the Web Fiction Guide, a wonderful place to find all sorts of online fiction. If you are so inclined, I would appreciate any ratings/reviews/recommends on that site to help get TOCL noticed. Thanks! At the end of Part 35, Tumble had shared food with the bandits who moments before had tried to kill him and Allin. The bandit leader, Ballister, invited them both back to his village for a proper thanks, and Allin reluctantly agreed to go. In order to get the jump on us, Ballister and his men had taken the high road through the ducts. I had crawled through enough ducts in the past week, so despite his protestations that it would be safer that way, I convinced him to return to his village by way of the ancient, decaying corridors. Actually, village was too kind a term for where he lived. It was more like a room. A humid, noisy, machinery-filled equipment room that about fifty people had converted into their home. The basics in this case consisted of overhead lighting, a steadily dripping pipe that provided brown water, a tank used to grow edible algae, and rows of shelving that served as bunks for the people who lived there. Mostly these were adults, although two children scurried about playing a silent game of tag and one baby was asleep in a woman’s arms. All of them were filthy. It was obvious that whatever water they managed to collect, there was none to spare for something as frivolous as keeping clean. Tumble remained inscrutable underneath his hat, but I could well imagine he was thinking the same thing as me, that this room was a hellish mirror of Pudlington. Something of my thoughts must have been clear on my face, because I caught Ballister scowling at me, but either out of pride or resignation, he chose to ignore it. I felt bad and tried to keep my face neutral from then on, but I stuck to breathing through my mouth to lessen the stench a bit. I had grown up always on the move. Back then I thought it was simply my parents’ choice to never settle down, before I found out that they were simply on the run from my uncle. But this room was in itself a good argument for staying in motion. Sure, it’s safer to hole up in a cramped room and bar the door, but what kind of life was that? Ballister introduced us to his people, who were nonplussed about our arrival but mutedly excited once they realized he had brought some supplies with him. No one fought or yelled at one another; they hadn’t the energy for it. They meekly accepted their small portion of the rolls and jerky that Tumble had shared and immediately set to eating. It was not much, but I could see them savoring it as if it were the sweetest candy. “Here,” I told Ballister, emptying all but one of my remaining nutri-bulbs onto a table. What could have fed me for a month would only be a few days worth for these folks if they stretched it, but the way their eyes lit up when they saw the bounty, it was as if I had just shown them the gates to heaven and promised them their own cloud. “Are you sure about this?” Ballister asked me before he would let anyone else touch the bulbs. Actually, I wasn’t so sure of that; finding food is always an iffy proposition in the city. But how could I leave here with a full backpack when these people were obviously on the edge of starvation? After the additional food was distributed, the mood in the room grew more relaxed. Most of the people went off to do their own thing, but a few stayed and spoke with Ballister, Tumble, and me, including the two kids and the mother with her baby. I ended up sharing stories of some of my adventures and mishaps in the city, and though Ballister warned the children to not be enticed by such nonsense, I imagined that I saw their eyes light up with the possibilities of life outside of their room. Later on, after the lights were dimmed in preparation for sleep, I was sitting on the top shelf of a tall storage rack against one wall. Tumble was nestled into the corner next to me, asleep sitting up. His hat was tilted down so that his face remained hidden. Ballister sat on the top shelf across from me, his head nearly hitting the ceiling, while below and around us, his people busied themselves with their bedtime routines. “Where did you all come from?” I asked Ballister across the narrow gap between shelving units. “I want to reach the surface,” I admitted. “He’s kind of along for the ride. Plus, he knows his way around here better than I do,” I said, adding that Tumble knew of an elevator that would hopefully take us Up a ways. 10/21/12 News: As of this page, Part 36, I have written to the end of Part 43, about 48,000 words total of an estimated 90-100,000. Since I am smack dab in the middle of the story, I recently reread the story so far, to make sure I am not leaving out anything from the early days of this project as I move forward toward the endgame. Needless to say, I noticed a lot of elements that need to be fixed, but overall I am happy that I have come so far with this first draft. Every time I see someone reading through the story from the beginning, or returning each week, it encourages me to keep writing. Thank you. In Part Twenty-Two, Allin learns what happened to Tyena after she left him three years ago. Namely, she got lost and was rescued by the cats, who took her in. Allin gives her an abbreviated version of his life events. After all, she might not take kindly to finding out that the man who ordered the werewolf invasion of Glin’s Rising, who kidnapped her family, is actually Allin’s uncle. Or that Allin is actually a werewolf, too. And when Tyena kisses him, he realizes he still has feelings for her. The next morning, Allin wakes up with a hangover from his gerrybrook juice binge. Apparently, he ended up passing out before his makeout session with Tyena could lead to anything else. Tyena goes back to her place to get ready for breakfast, and Allin gets ready, too. Tumble arrives and escorts Allin to breakfast. He also shares that Emperor Banshee brews his own gerrybrook juice from a deadly flower; in fact, he’s a master of that craft. Still sick from drinking too much of the juice, Allin is glad when Tyena shows up and Tumble’s story is interrupted. At breakfast, Tyena learns about the dangerous mission Banshee wants to send Allin on. In light of Tyena’s presence in Pudlington, Allin decides to reconsider Banshee’s offer, but this is really an excuse to spend time with Tyena. When Allin asks Tyena if she thinks her mom and brother might still be alive inside the Garden, she becomes sad and this puts a damper on the breakfast. She leaves to spend some time alone, leaving Allin with nothing to do, so he asks Tumble if there is a workshop he can use. In Part Twenty-Five, Allin visits the Skunkworks, a huge lab and engineering bay in the subway tunnels below Pudlington. He meets Professor Copper, who is working on solving the mystery of Allin’s lantern coil. She has found a way to increase the output of the sun mode, but is unable to access the moon mode. He then works on his own gadgets, such as making a light source to replace his coil and grapples for his gun. When he is done for the day, he visits Tyena for dinner and finds her painting. He learns that she has filled several floors of one building with her artwork as a way to keep busy. They discuss Banshee’s character and his plans for Allin. Tyena evidently wishes Allin would accept the mission, on the chance he could rescue her family. Allin agrees to think on it further, but he is inwardly anxious about the prospect of accepting such a dangerous assignment. He spends the next several days alternating between time with Tyena and time down in the Skunkworks, and as much as he tries to avoid thinking about the mission, he is always being reminded of it. Upon returning to Tyena’s loft one night, he hears her arguing with someone who is telling her time is of the essence. When Allin confronts them, he sees a Pudlington Guard holding Tyena by the arms. When the guard abruptly leaves, Allin tells Tyena he knows what’s going on. In Part Twenty-Eight, Allin tells Tyena he knows that she and Banshee are working together to convince him to accept the mission to infiltrate the Garden. Tyena admits Allin is right but explains that Banshee threatened her and Allin both with exile if she couldn’t convince him to accept. Allin resolves to leave Pudlington and invites Tyena. She accepts but asks for some time to get her stuff together. They agree to meet at her place in two hours. Allin seeks out Tumble so that he can go get his cocoon bag and gadgets from the Skunkworks, but when Tumble learns of Allin’s plans, he informs Allin that Tyena is actually a spy for Doyle and the werewolves! Allin is stunned and feels like an idiot for allowing her to manipulate him. Tumble admits Banshee was using her to coerce Allin, but there was never any threat of exile. Allin now resolves to leave Pudlington alone, but first he goes to tell Tyena off. Tyena admits she wanted to get Allin to go to the Garden since if he did, Doyle would free her mom (her brother is dead, murdered by the werewolves in front of her). She tells Allin that she wanted him to accept Banshee’s mission because then her mom would be free but Allin would still have a chance to survive his encounter with Doyle. Allin wonders why she didn’t just tell him the truth in the first place, but Tyena points out he wasn’t truthful about his connection to Doyle and the fact that he was actually a werewolf, too. Despite all that, she professes her love for Allin and asks him to go along with Banshee’s plan. Allin feels foolish and betrayed, so he rejects her and leaves her behind. At the gates of Pudlington, Banshee confronts Allin about his decision to leave, shaming him but not changing his mind. Outside of Pudlington, Allin readies himself to once again venture alone into the city called Earth, The Only City Left. Starting in Part Thirty-One, Allin has to make his way out of Pudlington’s outer defenses, which means heading into the maze of trap-ridden ductwork surrounding the city. He ends up falling down a shaft to a spike-lined pit (an oldie but a goodie), but manages to grab on to the shaft wall with his cling-tight boots right before he would have been impaled. His cocoon bag was not so lucky, falling onto a spike and spilling nutrient jelly all over its contents. Allin makes it down to the floor and retrieves the bag when who arrives but Tumble, who has been assigned to watch over Allin. Reluctantly at first, Allin accepts Tumble’s help and they make it out of the feline death maze together. Allin then recruits Tumble to help him reach the Roof of the World. Tumble knows there is an elevator not that far away, so they head for it, only to be waylaid by a group of dirty, starving brigands on the way. If you are new to The Only City Left and want a quick catch-up, you can read a synopsis of Parts 1-30 and then start at Part 31. You can reach an individual part of the story by browsing the Table of Contents. At the end of Part 33, Allin and Tumble had exited the maze of traps surrounding Pudlington and were on their way, hopefully, to the Roof of the World, the surface of the city-planet Earth. “How far down do you think we are from the surface?” I asked. We had been walking for half a day already, and while intellectually I knew that this was a tiny portion of the journey ahead of us, I felt an excitement in the pit of my stomach. I’m on the right path again. The corridors we walked through showed the ravages of time. Broken, decayed ceiling panels littered our path and ages-old wiring hung down in clumps from the gaps above us. Occasionally, a light still flickered anemically, but for the most part I relied on my wristlight. Tumble walked farther ahead, taking point since he could see well enough in the dark. Because of our distance, and out of a healthy respect for whatever might be lurking around us, we spent most of the day in silence. I was used to traveling alone, but when Tumble called a halt for a meal break, I looked forward to the chance to talk to someone outside of my own head. We picked a spot mostly free of debris, sat down with our backs against the wall, and pulled our food out of our packs. I had several nutri-bulbs, enough to tide me over for a few weeks, so I picked one out and dipped it in the remaining jelly. It actually made the usually tasteless bulbs more palatable, making me even sadder that most of it had leaked into my cocoon bag. I bit my tongue and kept repeating He meant well he meant well he meant well to myself. Oblivious to the mess he had caused, Tumble gnawed on a hard roll and fish jerky. He offered me some, but I passed. “So why the getup?” I asked to change the subject. Tumble had set his hat between us and I nudged it for emphasis. Between bites, he explained that the existence of a city of cats was thought by many to be a legend, and the cats preferred to keep it that way. He nodded and then our conversation ebbed for a while. Illuminated by my wristlight, the corridor around us lay still in its senescence. It felt as if the whole universe consisted of the sphere of light that contained Tumble and me. It was hard to imagine the enormity of the city outside of our bubble universe, and if I thought about it too much I would want to curl up and not ever move on. I tried to distract myself from those thoughts by eating, but Tumble’s talk of humans dining on the catfolk put me off my nutri-bulb. It seemed like no matter what amazing things humans could create—the city, genmod cats, whatever—we could find just as inventive and malicious ways to destroy them. “What do you think happened?” I asked Tumble softly. He didn’t need me to explain what I meant. Everyone who lives in the city must have the same question ever-present in their mind. He nodded but didn’t answer immediately. While I waited, I snapped open a tiny compartment beneath the dome of my wristlight and slid some crumbs of nutri-bulb inside, food for the glowing algae. They must have been hungry because their glow increased considerably as they absorbed the nutrient-rich scraps. When I closed the compartment back up with a snap, Tumble was ready to talk. He looked up and around, as if he could see through the ceiling, past the sagging wires and broken light fixtures. He wiggled the thin but very human-like fingers of one hand before his face, then made a fist and unsheathed his claws. Tumble sheathed his claws and turned his hand palm up. I was sure he would suggest joining the fight against the werewolves, but to his credit he stayed away from that forbidden topic. “We can but try. If I’m not mistaken, I’m leading us to an elevator. Working or not, that should be a nice shortwait—” Tumble cut himself off and held out his hand for silence. Whatever he sensed, I felt it, too. My neck hairs stood on end and a shiver shot down my back. We both stood up and Tumble settled his hat over his head again, tightening the chin strap with an economical yank of his hand. “Get ready,” he warned me, one second before the ceiling caved in on either side of us. I tensed, ready to fight, but I felt a gentle pressure on my calf and looked down to see Tumble pressing his hand against me. 10/7/12 News: The Only City Left is now listed on the Web Fiction Guide, a wonderful place to find all sorts of online fiction. If you are so inclined, I would appreciate any ratings/reviews/recommends on that site to help get TOCL noticed. Thanks!